The first type Y, also called Y10 called. This model was in production in 1989, 1990, 1991, 1992 and finally in 1993. ECU engine management computer for control of injection and stationairloop scheme for the Y10 with 1.1 litre engine. 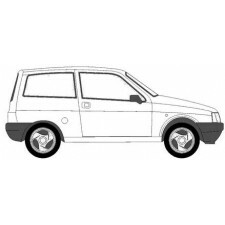 Applicable to the 1.1 Ie and on t..
Tail light glass without fittingdeel for Lancia Y10 (construction year 1989-1993), first version of the Ypsilon. It concerns the version in non-glass,..